Heart to Heart – MAASI IS TRYING! What happened when my kids’ vocabulary started improving! I’m a proud momma when I hear my kids using the proper name for things and not, “that thing over there!” Or “that thingy…”. I’m a proud momma when I hear my kids explaining things more clearly. It makes me feel like I’m actually a good parent when others can understand them. It’s amazing how smart kids can be if they just open their ears and brains a bit. I’m not saying my kids are stupid. Noooo!!!!! I love my kids. And when their vocabulary increases, it puts a smile on my face. When they can articulate why they liked something or not; when they can tell an interesting story using adjectives galore. (Still don’t understand how their English teacher says they need to improve more.) Vocabulary is great when we are playing Scattergories (name, place, animal, thing, game we all used to play). I am a proud momma when my kids talk about their day at school and all the interesting things they learned. I’m all open ears for this. It just puts a smile on my face. It’s a lot better than hearing them say that they are through with school and studying and how they just want to stay home like me! (Hello!! I graduated college with Honours!! …. before I stayed at home all the time) Hmmm…. Vocabulary is great. Just not when I’m tired and need peace and quiet. It’s been long, we know. Just checked our last post and it was published almost a year back. Yikes. Well, we have no excuse for abandoning our blog, just got extremely busy with our lives and unfortunately this little labour of love had to suffer. But we have decided that the show must go on, for our readers sake. And we may have been out of sight but the blog has never been out of our minds. Hence, we are here again, and this time we are not going anywhere (fingers crossed). For the time being it’s going to be Maasi Wajo and Maasi Saba who will be managing the blog mostly, since the other Maasis have a lot on their hands at the moment. That doesn’t mean you guys wont be seeing them at all, it’s just that it might be less frequent than you’d like. So basically the main focus of our blog has always been on helping our desi stay at home moms find some sanity in this insane world. However, we do write about other mommy related stuff as well, from time to time. We will be posting every Sunday starting from this week. We have officially launched our Instagram account as well, by the name @maasiistrying. Please do go and follow it, it’s pretty cool! So let’s sit back, relax and have fun again. The Maasis are back (once again) but hopefully (ahem) they are here to stay! Our blogiversary and some more good stuff! But we’re here now to pay our little gratitude to you, our lovely readers! PS: You must have noticed the things that have started happening on the page… after being silent for a couple of months or so (our bad!). We have a brand new profile picture for starters! Which is a tiny reminder of all the changes we have in store for you. Maasi is trying is in for a big time revamp. We’re aiming to give you more fashion news/tips, parenting tips/stories, life saving hacks, product/online store reviews, regular giveaways and a little insight on decor trends around the world. So a lot of exciting things in pipeline for you all. 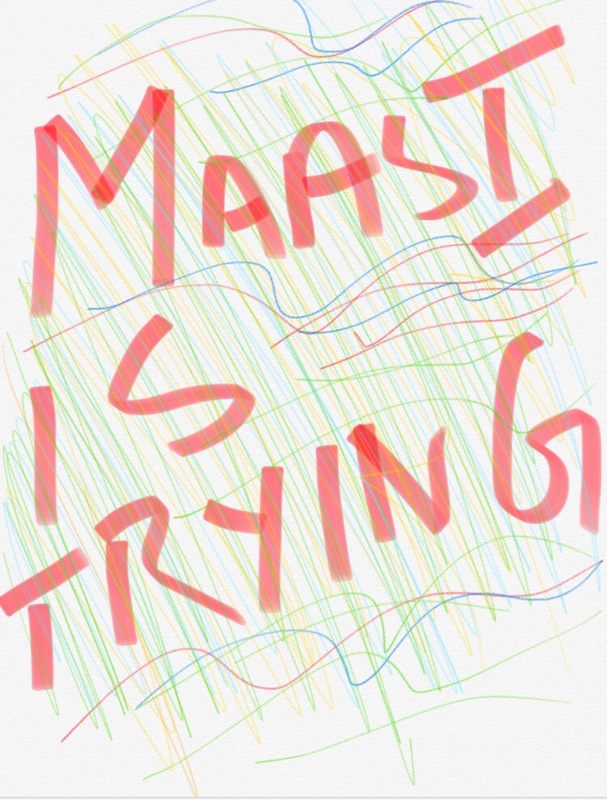 There’s a lot happening at the headquarters of Maasi is Trying! It was a hectic day today. I did feel a little too off all through the day due to my health which is downright adamant on not coming back to its usual chirpy state. [Now being busy or not- for that matter- does have a most complicated relationship with the heart. For if your heart desires to accomplish something; it will find a way and no amount of lack of time will matter. For there is no such thing as a lack of time as far as my (amateur) study of the matter is concerned. There is however a severe lack of discipline in my life though, the presence of which might very well be the eventual demise of all my dreams. If the demise hasn’t already happened that is. Which could be the case since I am usually not aware of most of the happenings related to my being. And most of the things come to my attention after the damage has already been done; by me or by someone else. Sigh. Crux of the story is, the little guy just doesn’t let me brood over the vanity of my life anymore (that I was bent upon doing for the last couple of years or so), which was something I gravely needed but didn’t quite realize before. He keeps me busy yes, but in a way, this little person has (sort of) renewed my sense of existence in life. My discipline situation has vastly improved (it hasn’t completely gone away I assure you, but yes, it has become better). I care about the sanctity of time now. Or perhaps I’ve started caring about it much more than I ever cared about it before. The joy and love this little being brings to my life is something I can’t even begin to describe here since there are no appropriate words to portray the many emotions he has brought out in me. Perhaps it is true what they say about babies that are born later in life; that you do appreciate them more. I’ll also add another thing here however. I think when you have these kids, you actually are in need of them— in order to take you back to the self that you’ve somehow lost somewhere. You need them to regain some confidence in the prospect of hope, of that much-touted ray of light at the end of the tunnel, again. Kids are amazing. Alhumdulillah. They make you smile, they make you laugh, and then they make fun of you and laugh at you. Out of love, of course! The other day, I was watching the movie “Burnt,” starring Bradley Cooper. (It was an okay movie. Watch it if you have spare time.) It was about a washed out chef trying to make his comeback and earn a 3rd Michelin Star. As I was watching the movie, my little one came and sat along side me. Thank goodness in that scene no foul language was spoken. The scene she watched was where they were preparing a meal for their restaurant. They made it look so easy. Cutting up vegetables with such precision. My little one, may Allah swt always protect her, says, “Momma, they are cooking just like you!” I stopped breathing for a few seconds, and remembered she wasn’t making fun of me, but felt that we cooked the same. Little does she know I’m just a mediocre cook. She said it twice with a smile. It made me feel so happy. Then a waitress was serving either green tea or coffee and again she said, “Look momma, they make keva just like you!” I gave her a kiss and said thank you and she she gave me a hug. Such sweet children we have. Their compliments are so much better then mens’! I guess it’s an awesome feeling to know something your parent’s don’t, and to know it with ease. I should be a good mother and just be happy and brush it off and let them have the moment. I should, shouldn’t i?….hmmm… I’ll think about it…for next time. I am a firm believer in the power of prayer. I am also a firm believer in this quote, “Whenever you do not understand what’s happening in your life, just close your eyes, take a deep breath and say, ‘Ya Allah, I know this is your plan, just help me through it.’” I’m always praying for something. Usually wanting something or not wanting something to happen. Scholars say that when we are making dua, we are directly speaking with Allah swt, meaning prayer is a direct link between our Creator and us, his creation. He and us. He and me. Just the two of us. There is no reason for anyone to go in between us and pray for us, while we sit back and relax. I remember listing to a lecture by Mufti Menk. He was talking about how his little daughter would beg and beg for something she wanted. He had said that that was how we were supposed to pray. Allah is the one and only one who can either give us what we want, or not give us what we don’t want. Mufti Mehnk said to pray like you were a toddler; when they really want something, they cry, they are asking (or screaming in a toddler’s case) with all their heart. All because they really, really, want it. We should try to pray with our heart and mind together. With kids always calling for us, and chores to be done, sometimes our prayers and duas are just said automatically, with no feeling. We need to take a few minutes for ourselves. This will take time. From my past experiences, I have learned a few things. There was once something that I didn’t want to happen. Everyone else was happy with it, but i had a tornado running inside me. I prayed and prayed for Allah swt to put it in everyones hearts that this wasn’t a good decision. I think weeks went by like this. Then one day, I felt I was being greedy and started praying that if this was good for me, to put it in my heart, and if this was bad for me, to put it in my parents heart. This went on for a few more weeks. Then one day, I just prayed for everything to go smoothly. I can honestly say, that that particular day, my heart felt at ease. I came to realize this was what was meant to be for me. I’ll share with you something. At that moment, when i cam to that realization, my brain was still screaming, “NO!, NO!” but my heart was saying, “be happy, this is good for you.” An ayah from the Quran comes to mind here. I can’t recall which one, but I remember a bit about the translation. It went something like this: Listen to your heart. It speaks subtly, softly. Your heart tells you what I want for you. It always will lead you to the right path. My path. Your heart is not influenced by anything, but me. Listen to it. Your brain is always influenced by society, culture, peer pressure. It will scream at you and confuse you. Your heart will not. The thing is, one doesn’t usually pay much attention to the heart tugging at you to make a certain decision. We usually ignore it, for a while at times. It’s not easy, but we just have to be patient and one day, we will hear what Allah swt wants. We will feel it. It’s like weight being lifted from your shoulders. Sometimes it will be what you were praying for all along. And sometimes, it will be what you were praying to not happen. That’s my case 90% of the time. So far, whatever I was praying for was not meant to be for me. I guess I don’t know what is good for me yet. But it’s okay. I am learning over time. Allah swt knows what is good for me, so I’m in good hands. Pray with your herat. Pray for it whenever it pops in your head. Just pray, say a few words to Him, it will bring some relief to your heart. Things will fall into place, and your heart will be at ease, and your brain will eventually stop screaming at your for thinking the worst. What is best will always happen. We just need to be open to it and we will understand it and be okay with it. Inshallah. I spend a lot of time with my daughters, which is an added perk of working from home. That said, most of these days what I don’t realize is that time is just passing by, I am there with them, but I am really not there. I am either watching TV (I’m a sucker for good TV shows.. sigh), or reading a book or (the worst) on my phone. Since they both are now more or less independent (one is 12 and the other one is 8) and don’t really need my company as such, I have also stepped aside and have started doing my thing. In a nutshell, I am usually only acting as their supervisor (telling them when to eat, do their homework, brush their teeth, etc.) and not really “in” the moment with them. Though when I really start thinking about it, what’s absolutely baffling is how fast time is passing me by!! It’s just that we being the forgetful human beings that we are usually don’t realize the speed of time when it’s silently going by us. And often suddenly get aware of the fact that we have wasted most of it caught up in a mind numbing daily routine. We get a glimpse of it each year at the New Year’s Eve when we realize how fast the year flies by us—and so we make new resolutions all over again which are then generally packed off for the next year, after a month or so. We don’t realize this most of the times, but we spend our lives exactly in the way that we spend most of our individual days. If there is something we cannot do today, chances are we won’t find the will to do it the next day as well. And sooner than we know, we are fifty and we don’t know where all our life went. So keeping this in view, one of my New Year resolutions for this year was to spend some quality time with my girls on a daily basis— be it going on shopping with them or going to out to eat together. Things that we have just stopped doing together for reasons I don’t remember now. Perhaps we got a little too busy with life. I haven’t been doing as much as I would like to and a month has already passed, but hey, we still have the whole year ahead of us, don’t we! Keeping my fingers crossed. I’ll definitely give you all a lowdown on how to spend some quality time with your kids once I figure out some sort of formula myself, but for the most part I’m sure it needs to come from the heart and it needs to be worked on. Keep watching this space for more! 2015’s last sun has set and in a few hours we’ll be welcoming 2016. We wish a fabulous and prosperous 2016 to all of our amazing readers. And thank you all for the support you’ve showed us all through 2015. We’re hoping amazing things for Maasi is Trying in the coming year and we hope we always have your support to guide us through! There’s this apt New Year’s quote by Neil Gaiman that we thought we’d share with all of you on this New Year’s Eve. We wish our cherished readers a very happy and rocking 2016!! Another cup of tea please! Happy weekend friends! This week has been awfully tough and the approaching weekend was the only one thought that made me muster up the courage to face the week. But glad its over (for now), Sunday is here and I can finally relax with my cup of tea and my laptop talking to all you guys. December just gets me immensely excited for so many things. Winter, holidays, happiness all around and an uninterrupted supply of tea when tea can really be enjoyed. In this part of the world, we get an awfully long summer spell, which usually lasts till the end of November. Days get better usually by the mid of December, but our winter typically lasts till the beginning of March and it’s mild, not very cold. So yeah, we have all the reasons to celebrate the little winter that we get to have around here. I just had to show off my mug collection now! Speaking of which, I am a huge fan of tea. Even our cruel summers cannot keep me from downing my 6 cups of tea in a day. But winter is when I enjoy it the most. There is something very warm about the whole tea experience, something that reminds me of home. Maybe that’s the only proper explanation that comes to mind. No surprises there since tea has been a staple drink in my life ever since I was a little girl. And now the obsession has gradually transferred on to my kids as well, since they cannot pass a day now without their morning and evening tea. There is honestly nothing better than a quiet evening at home lazing around with my favourite people having a cup (read cups) of tea, watching television. That’s what my depiction of heaven is! Anyway, I will now go get myself another cup of tea and then try to catch up on my reading. Sundays have never felt this good I tell you! Exam week again from tomorrow! Wish me luck. Also, end of 2015 is upon us, how have you all fared with this year and what are your plans for the coming holiday season? I’d love to hear from you guys. Time is a rare commodity these days since it’s exam time and trust me, all I want right now is a few hours to myself, with myself, ALONE!! I am getting the feels a wee bit more though, since it’s my 12-year-old daughter’s first go at exams. Normally schools in Lahore begin taking exams right from grade 1, but a few (very considerate) schools including the one my daughters go to, start end of term exams from 7th grade and above. I do like their approach better since it’s given me way more time to relax and chill compared to my friends who’d just go on quarantine as soon as exams would start. No, I wouldn’t like to change anything about it. I also feel that this approach gives our daughters much more time to grow up, understand, evolve as an individual rather than get into the exam rut when they can hardly tie their shoelaces properly. When you’re taking children as young as 5 into an examination hall, asking them to sit still for an hour or so and concentrate, how do you expect them to perform? They are not supposed to, its time for them to play and be merry. Let them grow up first. Exam can wait. So yes, I’ve always maintained that my preference for this school is firmly rooted in their lenient exam policy above all. But that also gives rise to this question that has always been lurking somewhere at the back of my mind. You see, I am an Accountant, I worked for some time but then eventually decided to quit work because I wanted to stay at home to raise my girls. It does unfortunately have a very negative connotation these days but I did not regret my decision once, back then. Now however, I feel that I am constantly being judged for this decision of mine. People don’t say it to my face, but I know they feel it’s odd for me not to be pursuing a career of some sort. They’ve somehow convinced themselves that just because I’ve decided to stay at home, I am “doing nothing” or am a loser of some sort who didn’t get the chance to get up the corporate ladder. I feel that this “doing nothing” phenomenon is what’s the most devastating of all. Only because I’m not adding much to the overall financial figure of my household, does not mean that I am “doing nothing”. I read. A lot. I’ve taken it upon myself to further educate myself (trust me, there is life beyond organised education). In my commuting hours I usually listen to philosophy podcasts and am reading Camus these days. I also write; I contribute to a couple of literary journals on a freelance basis. So just because I don’t go out, sit in a cubicle nine hours a day to achieve someone else’s goals, doesn’t mean I am “doing nothing” and “wasting myself”. What is the exact definition of wasting yourself anyway? I am sorry if this sounded too harsh but trust me; I have been subjected to harsher verdicts only because I’ve decided not to join the rat race. It’s just that my priorities right now are just different; or maybe my personality is, I don’t know. But I’m happy doing what I am; it’s as plain and as simple as that. I don’t understand why people have to underestimate or berate people who are doing something different from them. One of the things I shall never be able to understand I guess. Anyway, bottom line is, just live and let live. You do your own thing and I’ll do mine. Why judge people when you don’t know their story? Be happy and contented with whatever you do/ whoever you are/ wherever you are in life and that’s what should matter the most. Even if that means playing with your cats or driving your kids to and from school; it’s the little things after all!